If you need a little kick to get you going, simply add Best Energy™ to your water to give you a smooth, clean boost in energy and focus. Best Energy™ liquid water enhancer is designed to make supplementing quick & easy. Just squeeze it in your water and go! Best Energy™ comes in two great flavors, Fruit Punch and Orange, with zero added sugar and zero calories. 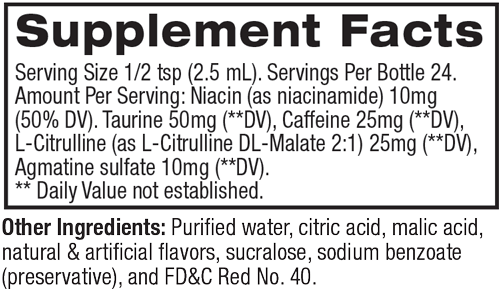 Niacin (as niacinamide) 10mg, Taurine 50mg, Caffeine 25mg, L-Citrulline (as L-Citrulline DL-Malate 2:1) 25mg, Agmatine sulfate 10mg. Fruit Punch: Purified water, citric acid, malic acid, natural & artificial flavors, sucralose, sodium benzoate (preservative), and FD&C Red No. 40. Orange: Purified water, citric acid, malic acid, natural & artificial flavors, sucralose, sodium benzoate (preservative), and FD&C Yellow No. 6. Shake before use. Add one (1) serving (1/2 tsp) into 6oz of water, or as recommended by a healthcare practitioner. Caution: BEST ENERGY™ contains the B vitamin niacin. Niacin may cause temporary flushing, tingling, skin reddening, and sensations of heat, especially if taken on an empty stomach. This is a common reaction. When should I take Best Energy? How much Best Energy do I need to take?